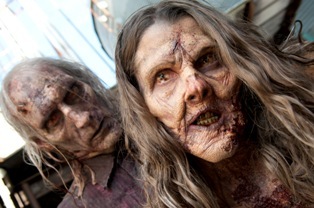 I hate to say it but, I’m getting a little bored with The Walking Dead. Sunday’s episode, “Arrow on the Doorpost,” had a decent start, but lost its momentum about half way through. Rick (Andrew Lincoln) and the Governor (David Morrissey) agreed to sit down and talk in a neutral location. This is what they did for the entire episode. Last week the show did a good job of showing the post-apocalyptic world the survivors are living in. 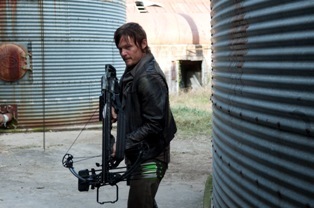 I liked seeing the state of things in another place beside the prison and Woodbury. This week we were back to the rivalry between those two locations, and I had a hard time staying interested. I feel like they should have gotten to this much sooner in the season and then moved on. Drawing out the inevitable battle is causing the overall story to sag. As I said, the episode got off to an okay start as Rick and the Governor first sat down face-to-face. The conversation was uneasy and tension-filled. 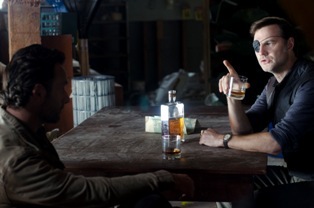 We know the Governor is good at convincing people with his words, and he seemed to be luring Rick in. The thing is, we know the conversation isn’t really going anywhere. The Governor is trying to manipulate Rick into doing what he wants. But, we also know the Governor wants to kill Rick and the entire group no matter what. What he’s really trying to get is information so he can plan his attack. So we know the conversation doesn’t have any real point. Nothing can be accomplished since the Governor doesn’t really plan on agreeing to anything. So why are we sitting there for an hour? What the Governor does tell Rick is that he wants Michonne (Danai Gurira) in exchange for him leaving them alone. I was kind of hoping for something a little more frightening like wanting Rick’s daughter as a replacement for Penny or something like that. That aside, the worst part is that Rick seemed to actually believe the offer was genuine and is considering it. It’s hard to believe Rick could be that naïve. I feel like too many people are acting kind of stupid lately. I mean Andrea (Laurie Holden) still seems to think the Governor is a rational person even though she knows about Penny and a lot of the other weird things he was up to. The only person making any sense the whole time was Merle (Michael Rooker). Rick took Daryl (Norman Reedus) and Hershel (Scott Wilson) with him to the meeting, leaving everyone else behind at the prison. Merle wanted the group to follow, ambush the meeting, and kill the Governor. Glenn (Steven Yeun) wouldn’t allow it. I don’t really know why. He wants revenge against the Governor himself. It seems like he just didn’t want Merle making any decisions. As I was sitting there watching, I couldn’t really think of any reason why one of them didn’t just kill the Governor. That would basically solve everything. The people of Woodbury are not likely to launch an attack without their leader, especially since Merle left them. Instead everyone wants to talk it out. It doesn’t make a lot of sense. Rick threw out Tyreese, he didn’t help the hitchhiker last episode, he didn’t want to let that injured guy into the group last season, so why would he have reservations about killing the Governor – a person he actually knows is bad? What I did like was the brief scenes with Daryl and Hershel bonding with the Governor’s people. It showed that not everyone has gone off the deep end, which I think is more realistic. It shouldn’t strictly be the us-versus-them situation Rick and the Governor have turned it in to. Milton (Dallas Roberts) especially doesn’t seem to be down with the Governor slaughtering Rick’s group. With only three episodes left in the season, things should be coming to a breaking point soon. I’m actually getting more curious to see where things will be headed for season four than how things will go down in Woodbury. I’m guessing we will get at least one more major character death this season – not sure who. Hershel would be an obvious choice, but Glenn or Maggie would be a bigger shakeup to the group. I’m hoping the season ends with some genuine excitement.